French President-elect Emmanuel Macron holds hands with his wife, Brigitte, during a victory celebration Sunday outside the Louvre museum in Paris. Macron, who never had run for office before, celebrated with thousands of jubilant, flag-waving supporters Sunday night outside the Louvre Museum in Paris. Marine Le Pen, his far-right opponent in the runoff, quickly called the 39-year-old Macron to concede after voters rejected her "French-first" nationalism by a large margin. 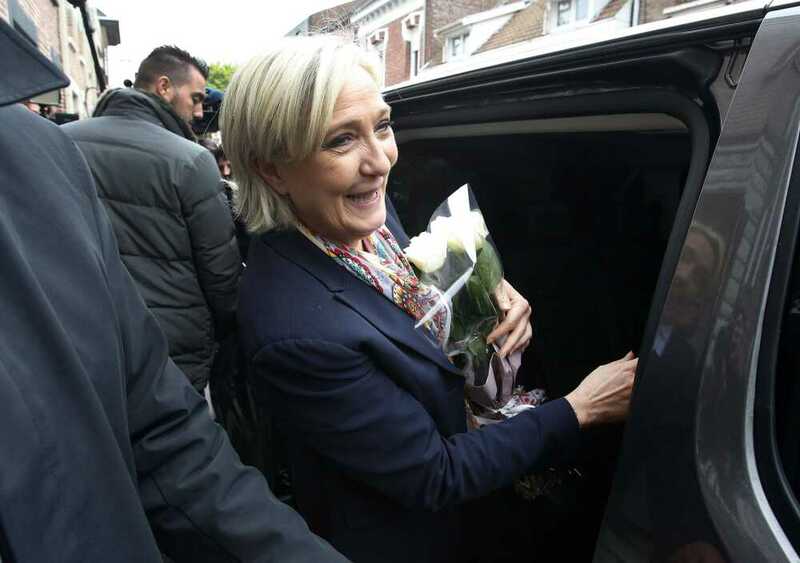 French far-right presidential candidate Marine Le Pen leaves Henin Beaumont, France, on her way back to Paris after casting her ballot Sunday. Le Pen's performance punctured her hopes the populist wave which swept Donald Trump into the White House and led Britain to vote to leave the EU also would carry her to France's presidential Elysee Palace. Macron told the Louvre crowd the Le Pen vote was one of "anger, disarray." The result wasn't close: With about 90 percent of votes counted, Macron had 64 percent support. Le Pen had 36 percent -- about double what Jean-Marie Le Pen, her father and co-founder of their National Front party, achieved at the same stage in the 2002 presidential election. Macron's victory strengthens France's place as a central pillar of the European Union and marked the third time in six months -- after elections in Austria and the Netherlands -- European voters shot down far-right populists who wanted to restore borders across Europe. The election of a French president who champions European unity could strengthen the EU's hand in its complex divorce proceedings with Britain. Macron said he understood some voters backed him reluctantly, simply to keep out Le Pen and her National Front party, which has a long history of anti- Semitism and racism. After the most closely watched and unpredictable French presidential campaign in recent memory, many voters rejected the runoff choices altogether -- casting blank or spoiled ballots in record numbers Sunday. Police sprayed tear gas and detained dozens of protesters holding running demonstrations through eastern Paris after the election results came out. Congratulatory messages poured in from abroad. Trump tweeted congratulations on what he called Macron's "big win" and said he looked forward to working with the new French leader. Macron has said he wants continued intelligence-sharing with the United States and cooperation at the United Nations and hopes to persuade Trump not to pull the U.S. out of a global accord fighting climate change. Unknown to voters before his turbulent 2014-16 tenure as France's pro-business economy minister, Macron took a giant gamble by quitting Socialist President Francois Hollande's government to run as an independent. His startup political movement -- optimistically named "En Marche! (In Motion)" -- caught fire in just one year, harnessing voters' hunger for new faces and new ideas.